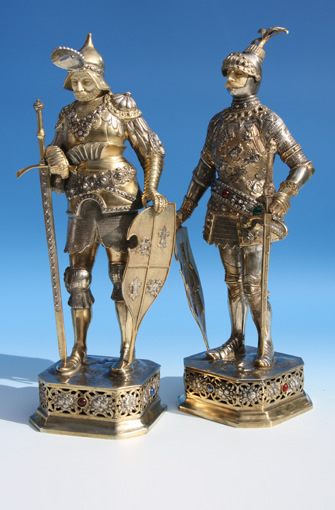 A pair of parcel-gilt models of medieval knights. 14 in. (35.5 cm.) high. See Gallery (Models and Novelties). Argenteus Ltd is located at the London Silver Vaults on Chancery Lane, adjacent to the city’s legal district. It is not just a traditional antique silver shop but a treasure trove of the finest quality Antique and Modern Silver, Sheffield Plate and Objets d’Art from the early 1700s to the present day. As well as traditional silver items – from tea sets and trays to candlesticks, epergnes and flatware – Argenteus Ltd also offers an eclectic mix of silver and silver plate, which include collections of spoon warmers and novelty condiment sets as well as models of knights in armour and a selection of magnificent Edwardian revolving domed-top meat carving trolleys. 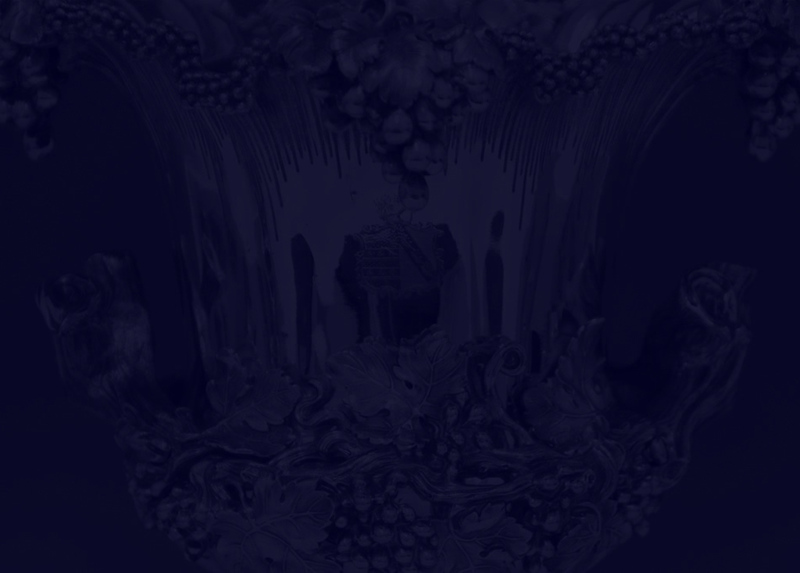 You might find a beautiful pair of George III silver fruit bowls by Paul Storr of London from 1810, similar to a pair on display in the Wellington Museum at Apsley House; or a spectacular model of the Spirit of Ecstasy standing alongside the world’s largest silver spoon, which has set the Guinness World Record. Displayed above a 47lb fruitwood Indian club used by Professor Harrison, Britain’s strongest man in 1852, hangs a silver mounted mirror that was originally housed in the pink guest room of Windsor Castle and was presented by Queen Victoria to the maid who regularly cleaned it! Argenteus Ltd is about more than just silver and Michael Feldman who founded the business in 1991 offers a unique approach to every piece that passes through his silver vault. "I greatly admire these exquisite pieces and the craftsmanship and attention to detail from an era when cost was not a primary consideration. The history of each piece is a passion of mine and where possible my research team and I will uncover the often fascinating provenance of these highly individual and luxury items. This lends an interesting perspective and brings the item to life." Award winning journalist, Nathaniel Lande of National Geographic, author, and a creative director for Time Magazine writes: "My first stop in London is always to see Michael Feldman at the London Silver Vaults at 53 Chancery Lane. His collection of Georgian silver is one of the most respected in the world, and I always find a lovely piece of silver to add to my own collection, which includes Queen Anne tankards and Edwardian flatware. There is no better shopping experience for those who love authentic hallmarked silver beautifully crafted. His shop Argenteus Ltd is first as you enter the vaults. Well placed and fairly priced for a fine investment. You won't be disappointed." Argenteus Ltd is registered at the City of London and Sheffield Assay Offices and is a member of LAPADA (The Association of Art and Antique Dealers) and CINOA (Confédération Internationale des Négociants en Oeuvres d'Art). Argenteus Ltd provides a fully insured, worldwide, door-to-door packing and shipping service and arrange all necessary paperwork including export licences should this be required.